Pancalen Cycles: Abdu's Miyata "California Cross"
It begun with a simple order of getting a stuck seatpost out of the seattube, and it failed. But the failed job lead to entirely different direction, and the result is a challenging yet exciting build. This bike was originally an early ‘80s 49cm Miyata California Road. A practical bike to begin with, it originally came with 27” (ETRTO 630mm) wheels, full-shroud aluminium fenders, front rack and obsolete Shimano Positron drivetrain. The owner, Abdu Shebubakar obtained it from one of his relative and originally intended to use the bike as his daily commuter. 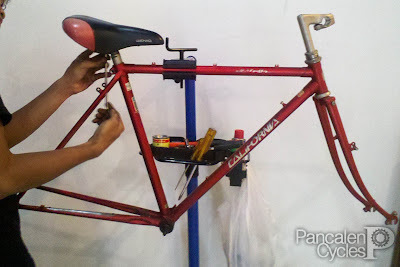 One problem: the seatpost is set too low and stuck there. His first order was to extract the seatpost, of which we failed because the seatpost is too deep and too thick to be extracted with our usual—and paint friendly—method. Going to our shop (and apparently, reading some entries on our blog) for a couple times must have some impact on Abdu's mind that one day he asked us to convert his California Road into a cyclocross bike. He reckons if we’re going to torch the seattube to get the seatpost out and then repaint the frame anyway, why not have some brake pivots attached also. Given our previous experience on the old Suntour frame, we accept the challenge immediately. 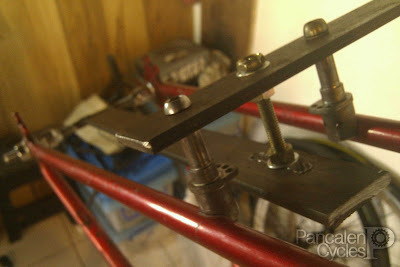 To braze the braking pivots on their exact positions we use our own homemade jig. The California Road’s rack mounts and eyelets are all left intact so Abdu can easily put the stock fenders and front rack (and maybe a rear pannier rack) for touring use. Those brazed-on cable guides were made by Shimano. As always we’re going with our usual approach on this bike by installing modern components everywhere. We’ll go with the convenience and availability of 700c tires so we put Shimano R500 wheels shod with 700 x 38c tires. The Positron have to make way with more modern Shimano Tiagra 4600 drivetrain, while two pairs of Dia Compe XCE cantilever brakes provide stopping power. Bolt-on aluminium chainstay protector is stock. How convenient is that. Turns out the seatpost is not the only thing stuck on this frame, we have to replace the stem as well. Instead of having a cable hanger mounted under the headset locknut we drill the replacement stem and put cable stop on it. The stock Sakae dropbar remain in use, wrapped in brown Charge U-Bend tapes to match the Bucket saddle. With its new appearance we feel proper to rename the bike as California Cross. In terms of budget the project may overshoot a lot, but both Abdu and us feel this new incarnation worths a lot more than its earliest brief.